Previzion allows simultaneous playback of multiple pre-recorded video streams mapped onto 3D background geometry. 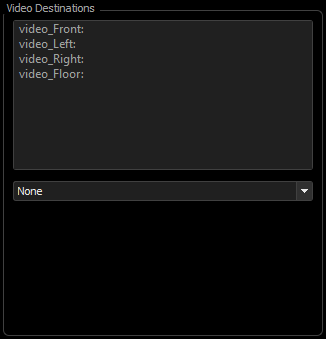 When the virtual set is being loaded, Previzion will search through the file for any textures with the video_ prefix, and list these textures in the Video Destinations interface. 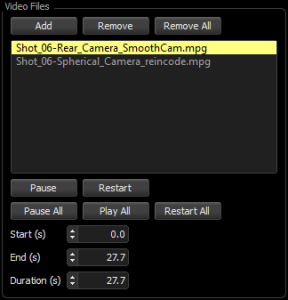 Each texture can then be individually selected and connected to an MPEG2 video on the hard drive. Once assigned, restart your videos by selecting Restart All(J), to restart all of the videos at their beginnings, to provide synchronized playback. In addition, you can Pause All(K) videos while keeping sync, and Play All(L) to pick up playback still in sync. 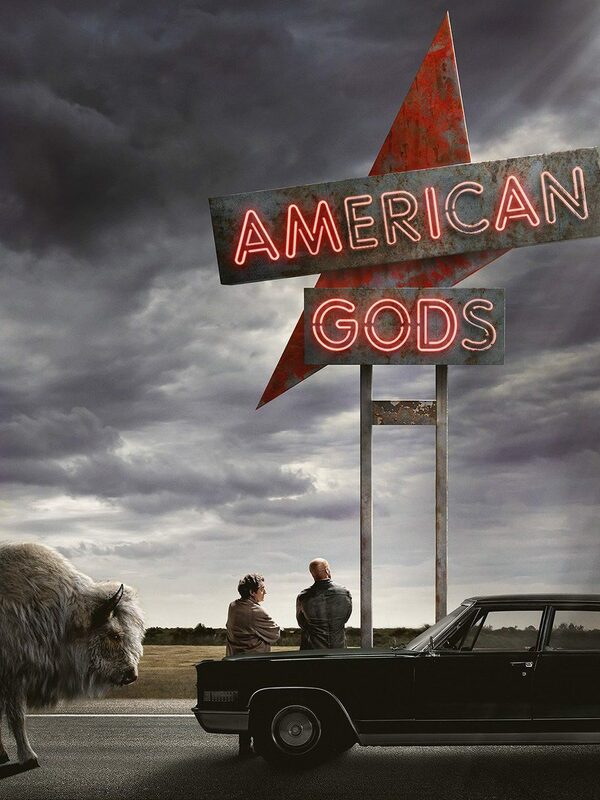 Videos can also be paused and restarted individually by selecting the video, and clicking Pause and Restart. The Start(s) and End(s) of the video file can also be selected, by entering the Start and End times. As well as the Duration(s) of the videos being played. When editing the Start and End times, the selected video will automatically be paused, and the frame displayed will move to match the time selected in order to help find specific areas of the video. 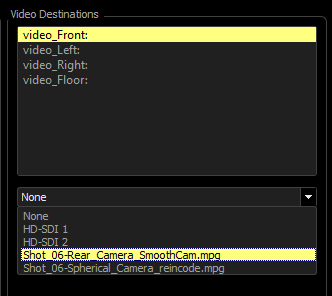 To connect a video, highlight the texture in the Video Destinations panel. This is where video_ textures, including those reference by CgFx shaders, are enumerated. Then, using the drop-down menu, assign a video to the highlighted video destination. Video streams, whether live or decoded, can be routed using the Video Destinations panel. This panel lists the possible areas that video can be routed to. Previzion supports simultaneous decoding of multiple HD frames. For example, a high resolution background matte painting can be broken up into multiple 1920×1080 textures, and played back simultaneously. 4K videos also have a limited playback. To ensure proper playback, each HD frame should be encoded with identical encoding parameters and number of frames. Look at our HD and 4K encoding documentation for instructions on proper encoding for Previzion playback and limitations. MPEG2 videos will play back at a 1:1 frame match to the incoming video rate, so they should be shot at the same frame rate as the live video to avoid sped-up or slowed down playback results.